Open Directly is a plug-in for Lightroom (version 2 or greater) that opens images directly in another program. The other program may be another raw converter, or it can be any program the user chooses. 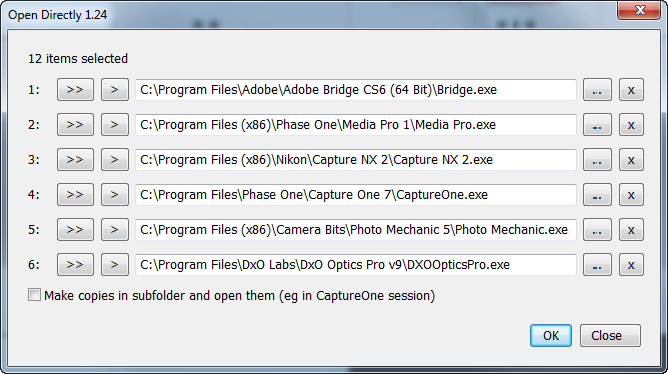 In either case, the plug-in simply sends the original file and invokes the other program. Some Lightroom users want to manage raw files in Lightroom but use another raw converter to adjust them. Unfortunately, although you can set up Nikon Capture, Capture One etc as external editors and launch them using Edit With command, Lightroom sends a TIF file rather than sending the raw file itself. Dragging the thumbnail to the other raw converter program's icon in the Mac's Dock isn't much use when you work in Lightroom's full screen mode. Another alternative, Lightroom's Export command, can launch the other raw converter but only by generating copies of the raw originals. Open Directly was originally intended to get round these problems. You aren’t limited to raw converters - you can send photos to any other program. For example, you might choose Mac's Mail application or HoudahGeo, a program for geotagging photos. The trial version allows only one external program to be defined. Purchasing the plugin will give you a registration code that will remove this restriction. All future updates are free.